U.S. stocks finished solidly higher Friday, with a rally in financials pushing most domestic equity indices to a small weekly gain. Investor optimism was renewed after President Trump signed executive orders to delay the April implementation of the DOL fiduciary rule and conduct a review of the 2010 Dodd-Frank regulations. Equity appetites were also sparked by a strong January payrolls report showing the economy added the most new workers in four months. Meanwhile, corporate earnings continue to pour in, with roughly half of the companies within the S&P 500 posting results. So far, earnings within the large cap benchmark have exceeded analysts’ consensus forecasts by an average of 5.6%, with only four of the 11 sectors posting a slowdown in earnings. The S&P 500 finished Friday within one point of a new all-time high, while the Dow Industrials closed back above the 20,000 milestone and the NASDAQ Composite ended at a fresh record high. In key economic data last week, a total of 227,000 new jobs were added last month, topping projections, and that was net of downward revisions for the prior two months that subtracted 39,000 jobs. Construction saw the largest jobs growth (+36,000), the largest gain since March. The S&P 500 rose +0.16% last week, while the Dow Industrials trailed with a -0.11% decline. The MSCI EAFE (developed international) also climbed fractionally, ending the week with a +0.03% gain. 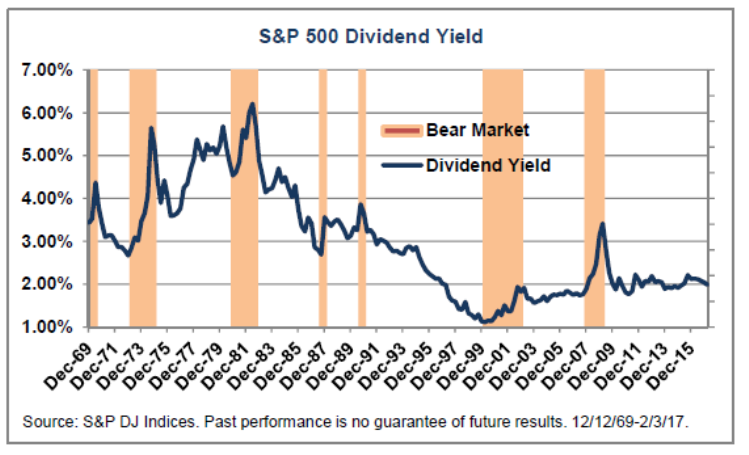 As Chart 1 illustrates, the S&P 500 dividend yield has shrunk from a recent high of 2.4% to just under 2% today. Not too long ago, the S&P 500 dividend fell from a 3.9% high in the 3Q 1990 (during the 3-month bear market & recession triggered by Saddam Hussein’s invaison of Kuwait) to a low of 1.12% 10-years later as the tech bubble burst and we subsequently entered a prolonged bear market. Today, the S&P 500 is up 2.6% since the start of 2017, and is higher by over 12% since the November presidential election. Is this decline a cautionary signal to be worried about? CFRA Strategist Sam Stovall says that while the dividend yield is lower relative to other periods, it yielded an average of nearly 3% since December 1969, it is still attractive relative to its competition: the yield on the 10-year note. Since 1953, whenever the dividend yield on the S&P 500 exceeded the 10-year yield, the market gained an average 18% in the coming 12 months, rising in price 83% of the time. Even when the 10-year yield exceeded the S&P 500 dividend – but by less than one percentage point – stocks still fared well, rising an average 11% and posting price advances 79% of the time. Even though stocks will eventually slip in price, it won’t likely be due to a shrinking yield, so long as it remains competitive with the 10-year note.